Vancouver’s The Birds & The Beets, seen on Thursday, is a whimsically curated café that feels tiny upon entry, but sprawls into an expansive back room with sightlines akin to still life paintings. Open Monday to Friday, 7 a.m. to 6 p.m.; Saturday and Sunday, 9 a.m. to 5 p.m.
Don't you just love the thrill of the chase? Natural-wine lovers in Vancouver – where the pickings of fresh, fermented grape juice made with little to no chemical intervention are slim – will surely relate. 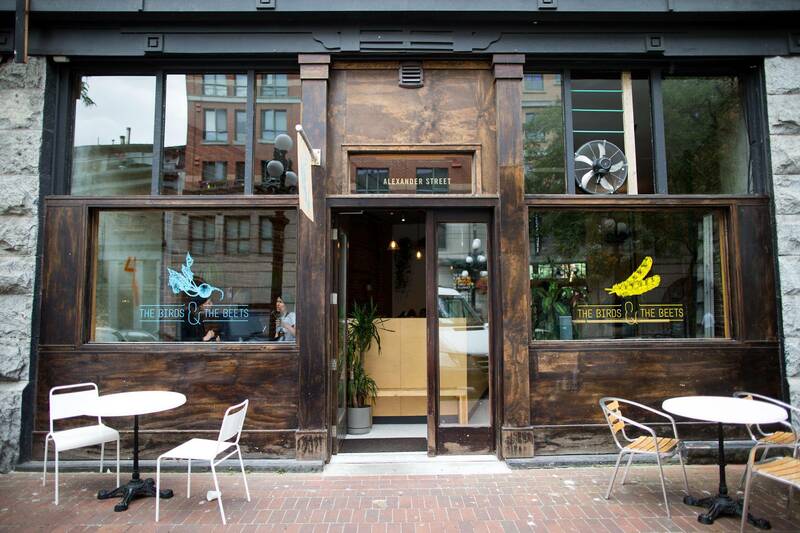 So when I heard about Juice Bar, a new Wednesday-night pop-up at The Birds & The Beets, I made a beeline to Gastown. Even more exciting was that it finally offered the perfect excuse to write about this adorable café and bakery. I was utterly charmed by The Birds & The Beets when it opened two years ago, and often recommend it to visitors from out of town. Yet the daytime hours and short counter-service menu seemed somewhat limited for a review. Having gone back several times over the past few weeks, I realize I was wrong. A café so whimsically curated, intensely food-focused and community-oriented deserves a typewritten hug. The space feels tiny if you walk in from Powell Street, but it actually sprawls into a more expansive back room with a second entrance on Alexander Street. The look and feel is difficult to capture in a single snapshot. As the eyes wander around various cubbyholes and nooks, the sightlines emerge more like a collection of thoughtfully composed still lifes framed in unfinished wood as seen through rose-tinted glass: loaves of crusty sourdough displayed on the counter next to Mason jars filled with toasted granola and half-pound bags of coffee; a sunny window-side benchtop surrounded by bouquets of bright-yellow billy balls, eucalyptus, lavender and prickly purple thistles (yes, they also sell flowers, from Wild Bunch Florist); self-serve water taps mounted over a bushy boxed fern to catch drips; natural canvas totes silk-screened with botanical prints hanging from a brick wall; a faded-green metal library trolley stacked with every cookbook you wish you had at home. Save for mayonnaise, everything at The Birds & The Beets, such as the charred vegetable sandwich, is made in-house with local ingredients. The breakfast-heavy menu is similarly wholesome. Save for mayonnaise, everything is made in-house with local ingredients, including all the bread and baked goods. There is thick, tart filmjolk yogurt sprinkled with darkly toasted granola and fresh berries (from UBC Farm). Fat slabs of red-fife-wheat sourdough (the flour is stone-milled in Vancouver by GRAIN) are ladled with loosely runny ricotta and a crimson float of sweet strawberry preserves. Creamy scrambled eggs are stuffed into buttery brioche buns, while softly poached eggs ooze vibrant yellow yolk over smashed-avocado toast. To think, all this deliciousness costs about the same as the doughy, undercooked breakfast rolls at Starbucks. And the service, overseen by owners Matt Senecal-Junkeer and Sean Cunningham, is so much more relaxed. Later in the afternoon, you might want to try an intensely nutty bowl of warm barley tossed with roasted carrot-sweetened miso dressing, tangy pickles and spicy seeds. Or perhaps an oil-poached albacore-tuna sandwich (the fish is from Finest at Sea) on tooth-tugging ciabatta spread with a gloriously green parsley vinaigrette emulsified to the texture of mustard. In addition to locally roasted Bows & Arrows coffee (espresso drinks and drip), there is a small selection of cider, craft brews and house-steeped ginger beer with a spicy kick. Birds & Beets’ miso barley bowl is intensely nutty, tossed with roasted carrot-sweetened dressing, tangy pickles and spicy seeds. The Birds & The Beets is a perfectly cozy (occasionally loud) hideaway for whiling away the day on your laptop. But it is only open during the day – for now, at least. The Juice Bar pop-up has been so well received, here's hoping it becomes permanent. Inspired by the exploding bar à vins scene in Paris, Juice Bar fills a big gap in the Vancouver wine scene. Sure, you can go to a number of forward-thinking restaurants that serve these lively, juicy, unmanipulated wines. Burdock and Co., Farmer's Apprentice, Grapes & Soda, Royal Dinette and Mak N Ming offer extensive lists. But they're all sit-down restaurants and relatively expensive. The thing about natural wines is that they really lend do themselves to sampling. Without all the preservatives piled into mass-produced labels, they can be fragile. They are idiosyncratic. And sometimes, they are terribly flawed. Unless you're a diehard purist who enjoys turpentine scent of volatile acidity and the mouse-droppings taint of lactobacillus infection, the thrilling treasure hunt can quickly crash into a high-stakes game of Russian roulette. Juice Bar, where the wines are priced at only $10 a glass, lowers the risk. Self-serve water taps are mounted over a bushy boxed fern to catch drips. And it's a fun, festive event. The organizers close off the front bar and squeeze everyone into the back, light some candles and crank the tunes. The wine bar is set up on a shelf along a walkway in the centre of the room. There is nothing pretentious about it. The crowd favourite from last week's selection was a pét-nat rosé – Autour de l'Anne Wonder Womanne, replete with a bustier-clad superheroine on the label that belied the structural depth of the frothy fizz. There was also a surprisingly fruity chardonnay, Les Ammonites from Jura, that expressed very little of the oxidized mustiness common to the region. And Puszta Libre!, a juicy, chewy, refreshingly chilled Austrian Zweigelt that tempered the humidity of the muggy evening and went down easy with grilled-eggplant lasagna topped with ripely scented Taleggio. If you are at all curious about natural wines, this cute café and inspired weekly collaboration just made them a lot more accessible. Let's hope it turns into something more than just a summer fling.